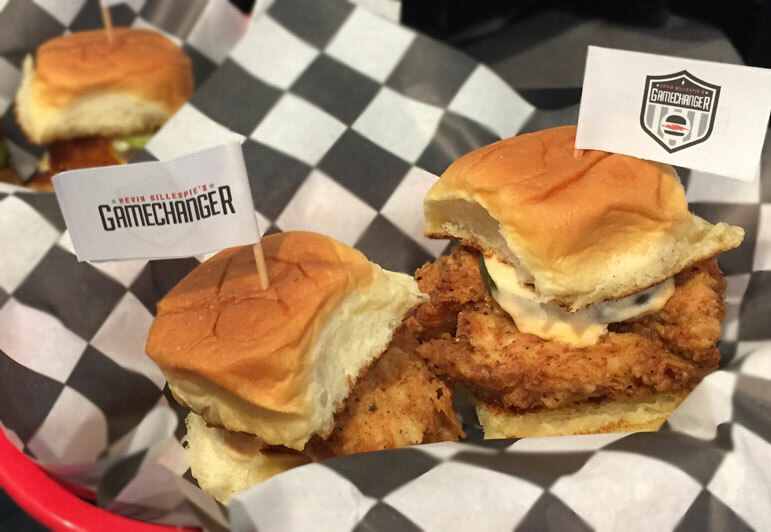 Why is it called Gamechanger? It’s about the new stadium and the promise they’re making to their guests. The premise of [treating] arena food with different values (in this case, higher quality) is game-changing. They built the stadium completely differently. We have a complete kitchen with the space to cook from scratch, and added more registers so that people can get their food fresh and hot. How did you get involved in working with the stadium? The Falcons ownership called me over a year ago. Initially I said I wasn’t interested, but when I heard what they had in mind, I got excited. In the world of stadiums and sports and entertainment, [Mercedes-Benz] is going to be groundbreaking—it’s a big deal for Atlanta. It lines up with being a part of the new, reimagined Atlanta, which is what my team had always wanted to do. Have you done concessions work before? Literally none. No one from my team has. That worried me, but simultaneously, I thought, “Maybe that’s not the worst thing in the world.” We’ll spend a lot of energy focusing on the flavors of the food and then teach ourselves how to execute it for a lot of people. We’ve gotten a lot of suggestions from the chef at Levy, the management company the Falcons hired to oversee all food service at the stadium. In my opinion, it’ll take three to four games before we really start to get it together, but from what I hear, that’s par for the course. I am a huge, obsessive football fan. The idea of being a part of the energy of [the stadium] was really exciting. We don’t expect this to be profitable for our company; [instead] I think it’s important that Atlanta has an amazing stadium with amazing food and drink. This city has supported everything I’ve ever done. I think that overall mission is more important [than the profits]. How did you create the menu for Gamechanger? Originally we started with what we called the “fan favorite” menu—the favorites from [Gunshow, Revival, and Communion]. The single most popular thing I’ve ever done in my career is the Closed on Sunday chicken sandwich. It’s hard to argue with fried chicken. Other than that, we developed new menu items for the stadium [thinking about what could be] cooked relatively quickly and could last for more than 30 seconds before it goes bad. Why did you initially create a Closed on Sunday sandwich? People love it. I created it eight years ago for family meal for the kitchen staff. We were joking that when you wake up on Sunday you want Chick-fil-A. We tried to tick the same boxes on the flavor profile. When we opened Gunshow we added it and people went crazy. We had to take it off the menu because people were just hanging out waiting for chicken sandwiches. It went on the menu for brunch at Revival and became a crazy seller. And football games are mostly on Sundays so it’s going to ring true. It’s the most complicated of all the dishes at Gamechanger. 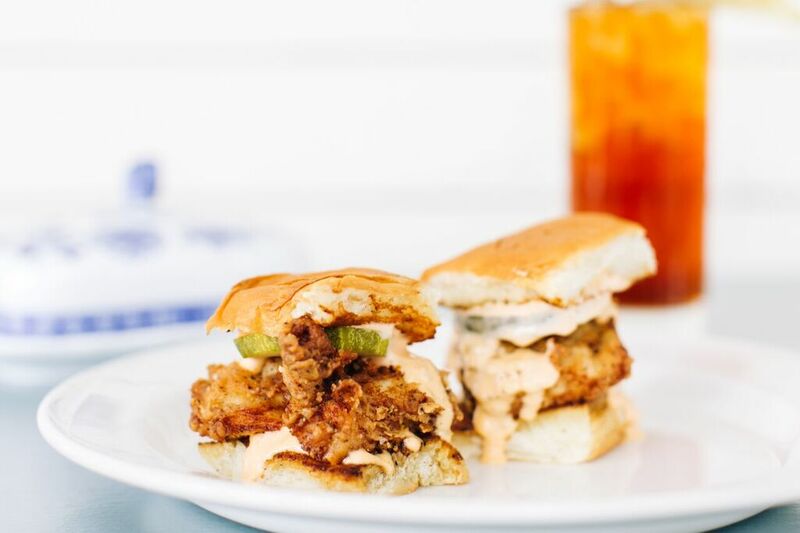 It has six components: a bun brushed in sorghum butter, sour pickles, chicken breaded and fried, and two sauces—hot sauce and sweet pickled mayo. It’s really messy. The target is 1 to 1.5 minutes to get food to the customer, based on the idea that we’re not cooking your specific order, we’re just cooking constantly. Our spirit animal is the Varsity. We’re trying not to get so far ahead that anything gets cold or soggy. We’ll have a cheesesteak made grass-fed beef ribeye that is shaved thin and mixed with spices, then cooked on the flattop with roasted Vidalia onions, topped with shredded sharp provolone, smoked cheddar, and a liquid Tillamook sharp cheese sauce, and served on a H&F hoagie. We couldn’t agree as a team if the cheesesteak was better with liquid or melted cheese so we decided it must be better with both. We’re also making a spin on pork French dip. We’re marinating and whole-roasting bone-in pork shoulders. We’ll chop up the meat and mix it into the au jus, onions, and carrots on a H&F hoagie with a modern version of dry mustard horseradish sauce with green onion. It’s delicious, hearty, and very filling. I love crinkle cut French fries more than any sane person really should. I love a fluffy French fry and a crispy French fry, so we had ours specially made. They are laughably long—8-10 inches—and we created a spice blend emulating the taste of Lay’s sour cream and onion potato chips. We’ll serve half-pound for $5. We’ll have one more menu item closer to October. It’s called Devour the Competition. I need to always be able to do something fresh and fun, so the idea is to develop menu items around the visiting team, artist, or musician. So we may have a spin on the muffuletta when the New Orleans Saints play the Falcons, or a lobster sandwich when we play the New England Patriots. A half-pound is a lot of fries. What made you want to do such a big portion? It’s based on how much people can carry back [to their seats]. They don’t want to have to get back in line multiple times, so we make the food a generous portion. Historically, it’s frustrating how long it takes to do these concession stand transactions. We’re trying to make this a one-shot, one-kill thing, and make it as user-friendly as possible so a single person can carry all the food necessary for two. What about beer on tap? We’ll have Wild Heaven, Creature Comforts, Jekyll Brewing, and Ballast Point. We’ll also have grown-up slushies. One is a strongly brewed unsweetened iced tea mixed with lemon juice and peach nectar. We’ll sweetten it and spike it with Tito’s vodka. We’ll also have my riff on a hurricane, Cyclone Punch. It’s a blend of pineapple juice, cranberry juice, and pomegranate juice, spiked with Tito’s. It’s like a grown-up fruit punch. Switching gears, tell me more about the RedWether Collaborative, your new restaurant incubator/food hall partnership that will launch in Nashville and Kansas City. I think moving into a role like this one is the natural growth and evolution of my career. I’m working with Meriwether, a company that builds and operates collaborative restaurant environments. The restaurant world is changing rapidly. There are a lot of talented cooks who aren’t being given the ability to learn the business, and that’s hindering their progress. And it’s difficult to teach those values when it’s not their own money on the line. So this will be a single building that houses multiple restaurants [akin to a food hall]. We chose cities that have a burgeoning food scene where there are talented cooks that don’t have the money to take the next steps [to launching a restaurant]. The point is to take an idea they have that isn’t fully formed and start to iron out the creases. The leases are very short, 12 to 18 months. I build out the kitchens, so the cost of entry is very low. Customers will come in, find a table, and have a server for drinks. They can get up and go find the food they want and order from that kiosk. Then the food comes to their table. We want customers to have the direct interaction with the people cooking. People love a food hall because they like the freedom [to choose varied food options], but they don’t like necessarily doing all the work themselves.